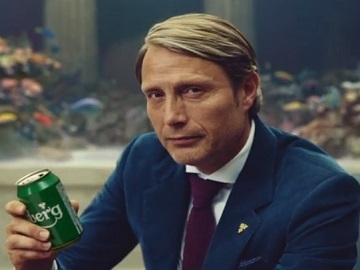 Mads Mikkelsen is back to the small screen in a new advert for Carlsberg, that focuses on the brand’s Snap Pack, described as “Probably the Best Packaging for the World”. The 30-second spot features the “Casino Royale” actor sitting in a chair, near an aquarium. “They say we, Danes, are masters of design. This is very flattering, of course, but we believe the most amazing design is found in nature,” Mikkelsen says, taking a look at the marine creatures swimming in the aquarium, including an octopus and a seahorse. “See, always elegant, inspiring even. Connected with minimal plastic. After all, less is more,” he also says, easily snapping apart a Carlsberg can from a Snap Pack and taking a sip from a beer. “A better kind of design for the planet, probably,” he adds. The ad, from creative agency Fold7, concludes with the onscreen lines “Probably the Best Packaging for the World”. According to the brand, its new Snap Pack reduces plastic usage through innovative glue technology. Developed together with NMP Systems GmbH, a wholly owned subsidiary of KHS, this type of pack uses minimal plastic and therefore reduces the risk of waste. Using less material also reduces CO2 emissions and reliance on fossil fuel-based packaging materials such as plastic. The new packaging – which replaces traditional, bulky plastic rings with a solution that instead bonds packs of multiple cans together – part of the brand’s ongoing sustainability programme Together Towards Zero, was unveiled in September 2018, in Copenhagen. In the UK, it was available from 10th of September on 6 x 330ml Carlsberg Expørt cans.